The Fermi paradox puts into words one of the common considerations someone might have regarding the presence of alien life: if they're out there, why haven't we directly interacted with them? Much debate can be had over the nuances of the topic, but one of the most interesting and amusing rebuttals to the thought exercise boils down to, simply, "Why would they? ", as if humanity's so insignificant in comparison to their advanced way of being that we may not be worth their time or effort. In a roundabout way, Absolutely Anything plays around with the idea of the Fermi paradox, making a collective of aliens so ambivalent of other planets and species that they simply decide whether to annihilate other lifeforms, after they stumble onto a satellite or whatever, once a member of their population has been granted boundless power to do, you guessed it, absolutely anything they want. Oh, there's a Simon Pegg-starring comedy somewhere in there as well, but it's so flat, dull, and full of headscratcher moments that the mind travels to other galactic considerations while watching it. A group of aliens, voiced by most of the guys behind Monty Python, hover in their jellyfish-looking ship out in the expanses of space. Whenever they find one of those information satellite capsules one can imagine that we've launched out into the final frontier, they randomly select an individual on the sender's home planet to gain control of the ability to manipulate everything around them, whether it's granting wishes and changing their luck or destroying the environment around them, and observe what they do with such power. Earth's number has come up, and the person who gets to be their representative is Neil (Pegg), a frumpy aspiring author in England who pays the bills by teaching at a middle school and who pines for his beautiful neighbor, Catherine (a reliably charming but indistinct Kate Beckinsale). Through happenstance, Neil discovers that he's essentially been granted infinite wishes, leading him to make decisions both small and big that impact his world. Little does he know that his choices will, ultimately, determine whether Earth will be roasted or not. Beyond, y'know, aliens being responsible for it all, there's a noticeable lack of originality involved with Absolutely Anything, tapping into bits-‘n- pieces of Bedazzled and Bruce Almighty in how Neil becomes empowered by his new capabilities … and how some of his wishes don't exactly go according to plan. The comedic talent involved here makes one not only want to overlook such derivativeness, but even look forward to how some of the minds involved with Monty Python and the Cornetto Trilogy might flesh out such a familiar concept, perhaps tossing their own brand of absurdity into the mix. Unfortunately, writer/director Terry Jones (in his last film release following his dementia diagnosis) and co-scribe Gavin Scott never push far enough with the inventiveness, and when they do tiptoe over the line toward something partially different, the silliness generates few laughs and tries too hard to even get those; the dog poo that walks to the beat of the film's score being a prime example. I mean, it's right there in the title: Absolutely Anything blasts the doors wide open for just about anything and everything to happen, yet it's surprising how little actually occurs in Neil's story, let alone how much of it relies on silly happenstance and accidental means to occur in the first place. The phoniness of how he's unintentionally goaded into blurting out his first substantial wish, as well as how he conveniently loses his godlike power just long enough to think he's casting a love spell when the loving ends up happening on its own, aggravates instead of charms with its calculated precision. What's more, Neil's boundless powers and infinite wishes -- and the availability for him to, essentially, erase and/or revert back on anything that doesn't go his way -- kill the stakes with basically anything he does, while also making one do a lot of thinking about what Neil isn't doing with these phenomenal cosmic powers. A dream sequence at the very beginning of the film involves more personal and credible wish fulfillment for Neil than what follows once he's deciphered his situation. When surrounded by how humorless and unengaging everything else ends up being, it's no secret why the goofy science-fiction aspects of Absolutely Anything stand out. Underneath bigger-than-expected visual effects, the straight-played boisterous chatter from the circle of aliens isn't exactly elevated by the fivesome of reliably entertaining Monty Python men, but their familiar vocal inflections might garner a grin or two alongside the general premise of them passing judgment on a species based on one dweeby white guy's moral decisions. 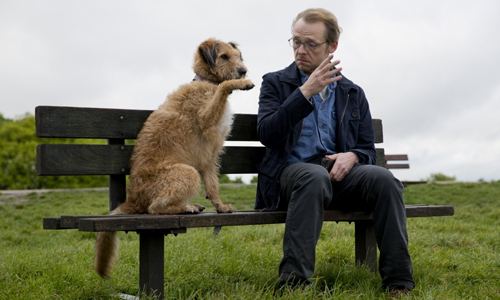 Both in script and from Simon Pegg's unadventurous delivery of the character, Neil turns out to be a supremely dull focal point for their energy, unaided by a frustratingly tame performance from Robin Williams -- one of his very last, a far cry from the charisma of Aladdin's Genie -- as the "rational thinking" talking dog Dennis. Despite a gunfight, the accidental creation of a cult, and Eddie Izzard forced into being a sycophantic school headmaster, Absolutely Anything squanders both the vast possibilities of its concept and the pedigree of the talent that'd hold the attention of someone, somewhere, out there.